Google rolled out Quick Access in Drive back in 2016 as a way to surface the files you're most likely to need. After debuting on Android, the feature later launched on the web. The latest Drive addition is an evolution of Quick Actions—it's called Priority. It's live in beta for select G Suite customers, but it will eventually come to everyone. The Priority page is accessible via the left-side navigation menu. It uses machine learning to identify files that you are more likely to need based on what you usually open and the content of those files. For example, important comments in shared files might surface in Priority, allowing you to reply without opening the full document. We've seen hints of this in past APK teardowns, and Google has talked about the feature at developer events. According to Google, most Drive users only open 10-20 files in a given week. The Priority screen will have "Workspaces" to help you organize those files without actually moving them in the Drive files system. You can create multiple Workspaces, and Drive can also suggest organization options. 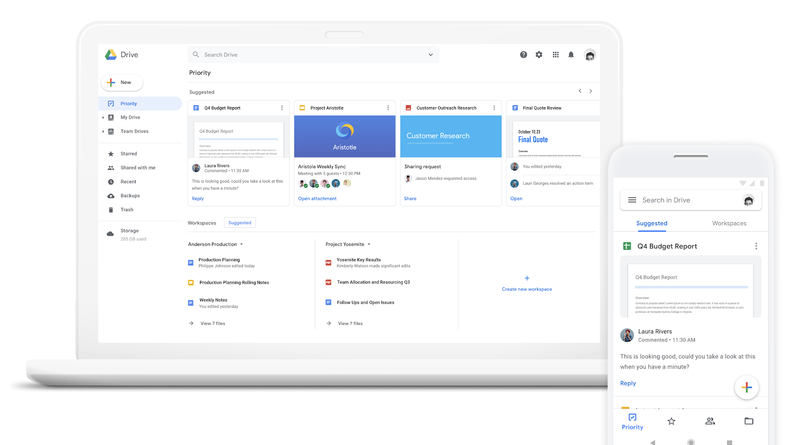 If you're a G Suite subscriber and want to see how Priority works, Google has a limited beta. Just sign up and wait for Google to get back to you.